Steep rent increases coupled with mold, bug infestation and crumbling walls prompted 16 Peninsula families to rally Thursday as health officials inspected an apartment complex, whose landlord is a former mayor of Foster City. The San Mateo residents were joined by Faith in Action Bay Area, a network comprising the San Francisco Organizing Project and Peninsula Interfaith Action. The organization said the Peninsula families' living conditions are common in cities across the Bay Area. "These types of actions are leading to mass displacement of thousands of families in the Bay Area," Faith in Action wrote in a statement. "The fact that the landlord, who is both a high-profile attorney and the former mayor of Foster City, feels that he can openly and blatantly get away with this type of behavior, reveals just how vulnerable tenants in San Mateo really are to landlord abuse." Landlord Wayne McFadden, however, insists that he hadn’t received requests to fix his property before the protest. "I have my name on every lease they sign and I give them a copy," McFadden told NBC Bay Area. "I got zero calls from all tenants." McFadden said he is working on the infestation problems, but residents say conditions have been left unsafe for nearly a year. Resident Jose Centeno, who lives at the San Mateo residence with his 11-year-old son, says they will soon be forced to move if conditions don’t improve. "I'm just in a very bad situation right now" said Centeno. "This bug problem we have, it's not just me. Everybody has this problem in here." Centeno will soon pay about $3,200 a month for their two-bedroom apartment following a $460 rental increase in July, which also required a matching security deposit. The price is just under the average rental price in the city, which rounds out to more than $3,500 for a two-bedroom apartment, according to data from Rent Jungle, a housing search engine. Apartment rentals in San Mateo have increased by $146 over the last six months on average, but Faith in Action Bay Area said this is several families' second increase of nearly $500 in the last year. 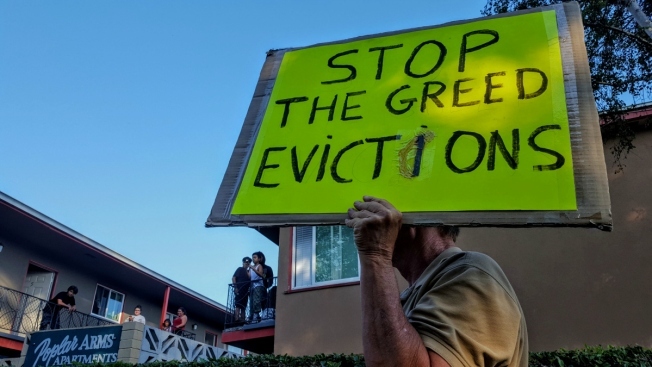 "This situation exemplifies how some landlords are too eager to exploit the housing crisis at the steep cost of further destabilizing our communities here in the Bay Area," said René Alejandro Ortega, an attorney at Community Legal Services in East Palo Alto. Faith in Action Bay Area says it has not been updated on any actions taken on the property since the rally Thursday.